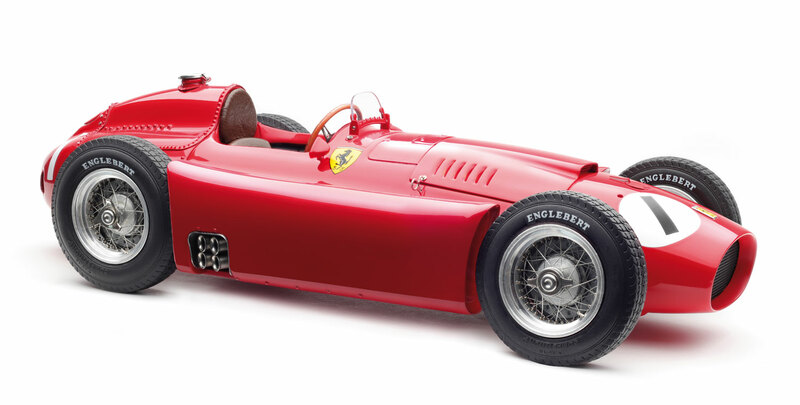 CMC offers you a meticulously hand-crafted precision replica of Fangio’s winning car at the GP of Silverstone 1956 — a short-nose Ferrari D50 with starting number #1. Initiated by Gianni Lancia with the backing of technologically cutting-edge ideas, the D50 project proved to be a worthy pursuit in the hands of Enzo Ferrari. Scuderia Ferrari had a highly successful F1 racing season in 1956. At the Grand Prix of Silverstone, England, Juan Manuel Fangio and Peter Collins raced their D50s to a double victory. The race was characterized by a high failure rate: Only eleven drivers crossed the finish line. The 1956 Grand Prix season had its sixth race take place on July 14 at the Silverstone Circuit of England. The 4.71 km circuit was to be lapped 101 times in order for each contestant to complete the race. Scuderia Ferrari entered Juan Manuel Fangio, Alfonso de Portago, Eugenio Castellotti and Peter Collins for the race, each in a short-nose Ferrari D50. The Maserati’s lineup consisted of Stirling Moss, Jean Behra, Cesare Perdisa and Paco Godia, each manning a 250F. The team Vanwall was made up of Maurice Trintignant, Harry Schell and José Froilán González. After a long absence from the racing track, BRM was back with Mike Hawthorn, Tony Brooks and Ron Flockhart on its team. Also present at the Silverstone race were the local team Connaught and the French racing team Gordini. In addition, there were a number of privateers in the starting grid, bringing the total of contestants to 28. In the qualifying practice Fangio and Moss had fought for the top starting position, which eventually went to Moss. For the only time Fangio had a very good start, an early spin caused him to drop back. On lap 16, Moss took the lead, and Hawthorn was close on his heels until technical problems forced him out on lap 24. Moss was now leading privateer Salvadori in a Maserati 250F, and Fangio was in third place. A pit-stop for a refill of engine oil cost Moss some valuable time, and he scrambled to make up for it before regaining the lead. On lap 63, Collins had to retire with a serious technical problem, but he was able to resume racing in Portago’s car. On lap 69, Fangio took the lead. As bad luck would have it, Moss ran into serious trouble shortly before the end of the race – this time with a broken axle, which put him out of the game. After all the dust had settled, Fangio won at Silverstone for the first time in his career.